The following sets can be used in a high-low offence, see Offence - High-low basics. For additional plays, see Offences - Carleton Ravens, 1-4 Dive Series, Break 1, Break 2, Break 3, Quick hitters - Clear series, also Duke Actions. 1 has an offensive matchup on the perimeter, passes to 2, backscreens for 4 and clears high weakside to the reversal spot, into high-low. 2 passes to 4 who uses a dribble-at, 1 backcuts, 4 hands off to 3 and pops (or rolls), 5 and 2 stagger screen for 1, 5 posts if 3 throws back to 4. Get into high-low if 1 finishes the swing to 2. See Quick hitters - Clear sets (Train, Train strong), Offence - 1-4 Dive series (Cougar). 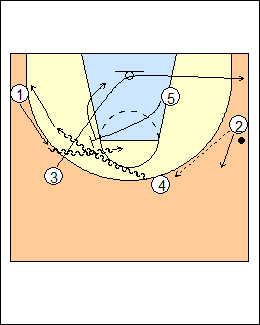 4 passes to 1 and follows to pick and roll (or uses a dribble handoff), 3 fills behind. 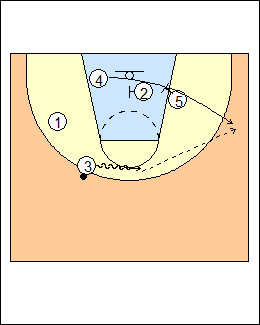 Option - 3 runs the baseline, giving 4 room to pop, see Offence - High-low basics. See Offence - Flex specials (Phoenix Suns 1 Twist). 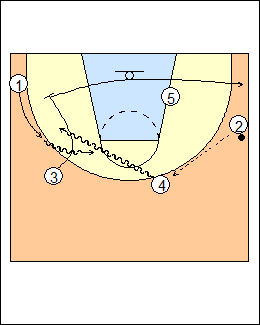 Twist-slip - 4 slips a ballscreen, 5 sprints up to pick and roll. 1 passes to 2 and clears to the weakside corner. 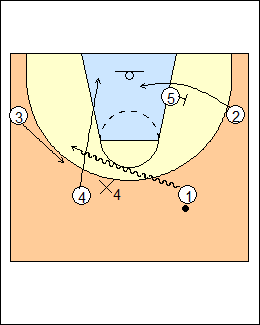 4 dribbles at 3, who backcuts and clears, 4 hands off to 1 and pops, 5 picks and rolls, and posts if 1 throws back to 4. 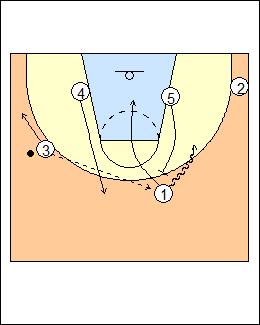 See Offence - Xavier middle ballscreens (4-out weave). 3 pins down for 1 then clears weakside, 4 makes a dribble handoff. Optionally 3 can fill behind the handoff. 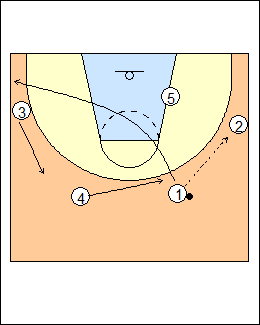 See Offences - Kowalczyk ballscreen (Pin down), also Carleton Ravens (wing-entry variation). 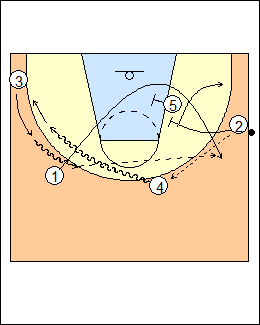 3 has an inside matchup, 4 dribbles at, 3 backcuts and posts, look for a pass inside from 1. 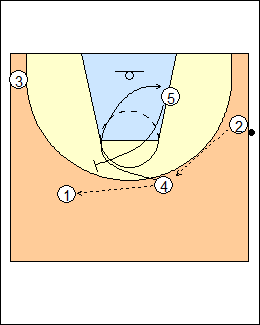 See Offence - Kowalczyk ballscreen (Hook post), Quick hitters - Clear sets (Double black), Fast breaks - Larry Brown (Dive post). 4 dribbles at, 3 backcuts, screens for 5 then clears weakside. 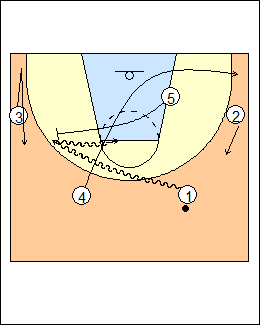 Option - if there is no pass inside, 5 runs out to pick and roll. 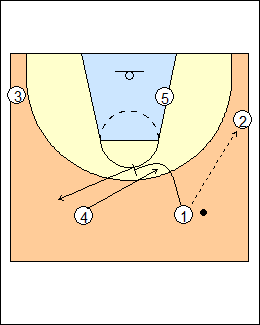 See Offence - Kowalczyk ballscreen (Screen the screener), 1-4 Dive Series (Eagle), Quick hitters - Clear sets (Swing). 5 starts weakside (open post), 1 passes to 2, baskets cut looking for a return pass, cross-screens for 5, then empties weakside. If 2 is denied, 1 can dribble-at X2, 2 backcuts then cross-screens for 5 if there is no pass (Dribble-cross). 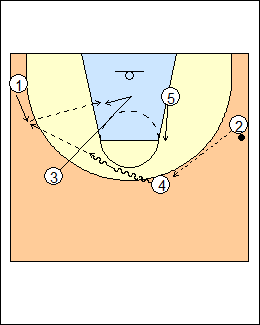 On ball reversal to 3, 4 follows to ballscreen (Swing). 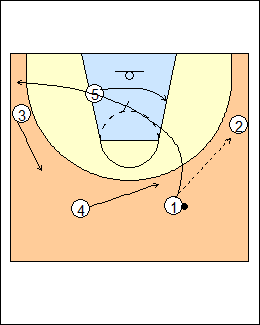 If 3 passes to 1, 5 comes up to pick and roll, 4 replaces. Look for a high-low pass on a throwback to 4, if it isn't there, reverse the ball to 3 for a pass inside. 4 is overplayed, 1 dribbles at X4, 4 backcuts. See 4-Flip above, Fast breaks - Early ballscreens (Dive), Offences - Dribble-drive ballscreens (Dive), 1-4 Dive series (Huskies). 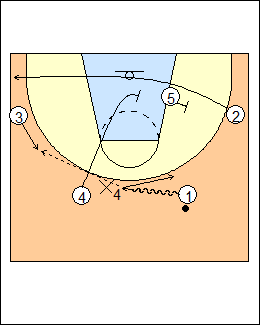 1 passes to 3 and spaces away, 5 and 4 stagger screen for 2. See Offence - Nets (denials). 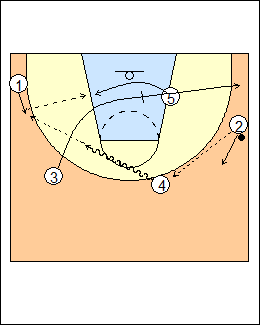 2 cuts off a flex screen from 5, 3 gets a dribble handoff. See Quick hitters - Cornell ballscreen. 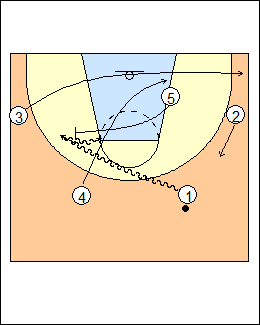 2 and 5 stagger screen for 4. 4 backcuts and clears, 5 ballscreens for 1. 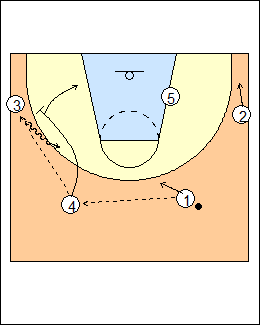 1-Flip - 1 makes a dribble handoff to 3, 5 picks and rolls (see 4-Flip above). 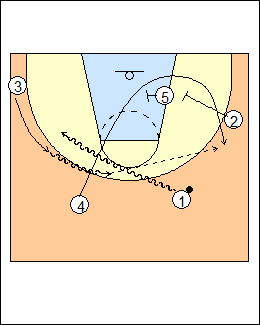 See Fast breaks - Early ballscreens (Ravens).